Paper Size 8.5" x 11" to 8.5" x 14"
The FD 6102 is a low volume folder / envelope inserter that is small, quiet and very easy to use. In automatic mode, you can fold and insert one sheet of paper from each of the 2 feeders, along with a reply card, envelope or folded brochure from the insert feeder. You can also fold paper without inserting. You can have it seal the envelope in the process or not. It is your choice. 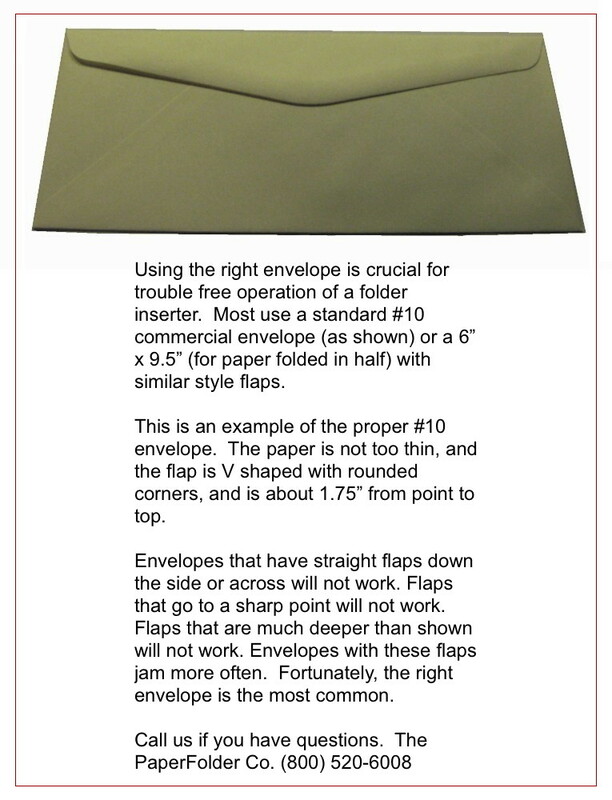 You can use either a #10 commercial envelope (tri-folded letter size or double-folded legal size) or a 6" x 9.5" envelope for half-folded letter size paper. The envelope you use is important. Click to see the envelope that works (fortunately, it is the most common). The 6102 has a slot that allows you to manually insert up to 5 sheets of 20# bond paper (stapled or unstapled) which is then folded together and at your option, put into an envelope. You feed these sets manually, one at at time. If you need to automatically process more sheets, look at the other folder inserters. They are shown in increasing capability. The 6102 is rated to process up to 5,000 envelopes per month at speeds of up to 23 pieces per minute. Fold types are C (letter) for letter size paper and double parallel (fold in 1/2 and then in 1/2 again) for legal. You can store up to 15 programmed jobs which can then be selected at the touch of a button. This is a great machine for those that need to mail a one sheet invoice or statement, with the ability to add a second sheet and reply card or envelope. The quiet operation and compact desktop design of the 6102 fits any office environment. A large, color touchscreen control panel easily guides operators through setup and operation. If you send out over 500 envelopes per month, a Formax 6102 folder inserter will save you a lot of time and money. You can buy it via check or by using our PayPal 6 months no interest program or lease it for up to 5 years for as little as $160. Call us for details. We sell Formax folder inserters. When you buy one, we want to make sure that it works with your stock. So, Formax requires that you mail them a sample of your documents and the envelopes to test on the machine. They will test and send the results as approved or the changes that are needed. You are asked to sign and return this before the machine will be shipped. 1. The address is on the bottom of the page. Some checks are printed this way. This requires a bottom flap envelope. The machine expects that it will be on top. Regular envelopes will not work. 2. The construction of the envelope. It requires a #10 envelope with seams that angle towards the center. All corners are rounded. If your envelope is different, it will need to be replaced. 3. The address does not fit in the window when the letter size paper is folded in thirds. There is very little adjustment that can be made up or down to the fold. If it does not fit, it may need to be shifted to properly appear. After receiving your acknowledgement of the results of the testing, your machine will be shipped. Normally it can be on site within 10 business days or less. On-site setup and Training is included with a 90 day on-site parts and labor warranty. Get a quick quote for the best deal. Buy or lease. We will send back a quote including freight, setup, training and on-site warranty.